Apparently bowing to an undercurrent of criticism, the latest beta of iOS 12.1 now features an updated bagel emoji intended to look more appealing. The bagel in iOS 12.1 beta 4 is better textured, and filled with cream cheese, Emojipedia noted. 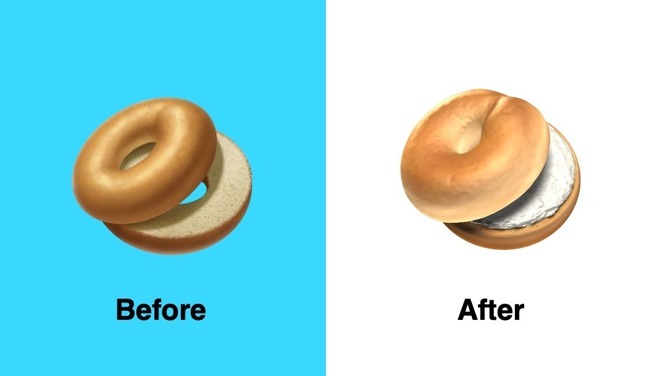 Some people had complained that a previous graphic didn't look especially tasty — one critic, Grub Street's Nikita Richardson, suggested that it looked like it came from a "midwestern bagel factory." While most iPhone and iPad owners —and most other companies —are unlikely to care, some locales like New York City pride themselves on high-quality bagels. Apple has changed its emoji in response to public pressure several times in the past. In 2017, for example, it altered its paella emoji to reflect the original Valencia recipe. The company went in an opposite direction in 2016, reverting a realistic peach emoji back to a design that resembles a human posterior. Earlier this month Apple previewed over 70 new emoji slated for iOS 12.1. A variety of new foods, animals, and sports are included, but the most significant change may be more faces with red, gray, and curly hair, as well as for bald people. Accurate representation can be a contentious issue in emoji design, since omitting specific looks from emoji may feel like being excluded from the conversation.